California's 2008 building code appears to be effective in limiting damage from wildfire. But only 6 percent of the state's housing stock was built under those regulations. "I thought, 'Oh, well, the house is done,'" Oney Carrell said. A few days later, they learned otherwise. The Carrells' home survived the deadliest and most destructive wildfire in California history with a couple of warped window frames, a partially charred down spout and a stubborn smoky smell inside. Most of their neighborhood was destroyed. A guest house in their backyard, where Donna's father lived, was reduced to ashes, along with a couple of sheds. Yet their beautifully restored 1940 Studebaker sat untouched in the garage. A landmark 2008 building code designed for California's fire-prone regions — requiring fire-resistant roofs, siding and other safeguards — appears to have protected the Carrells' home and dozens of others like it from the Camp Fire. That year marks a pivotal moment in the state's deadly and expensive history of destructive natural disasters. All told, about 51 percent of the 350 single-family homes built after 2008 in the path of the Camp Fire were undamaged, according to McClatchy's analysis of Cal Fire data and Butte County property records. By contrast, only 18 percent of the 12,100 homes built prior to 2008 escaped damage. Those figures don't include mobile homes, which burned in nearly equal measure regardless of age. "These are great standards; they work," said senior engineer Robert Raymer of the California Building Industry Association, who consulted with state officials on the building code. Mushrooming cities such as Folsom, where an 11,000-home development is springing up, have the ability to bypass the state's safety standards in spite of considerable fire risks. The state, which offers cash incentives to bolster old homes against earthquakes, so far has done nothing to get Californians to retrofit homes built before 2008 for fire safety. It hasn't helped that housing construction went into a deep dive in 2008 and has been slow to recover. Raymer said only 860,000 homes and apartments have been built statewide since the code went into effect. That's just 6 percent of the state's housing stock. According to Cal Fire, as many as 3 million homes lie within the various "fire hazard severity zones" around the state. Dave Sapsis, a Cal Fire wildland fire scientist, said there's no way to know definitively how many of those homes were built before 2008, but he believes "it's the preponderance of them, the majority." "Most of our inventory that was here prior to the fire was (built) between the '40s and the '70s," said Paradise Town Councilman Michael Zuccolillo, a real estate agent. "The average home here was from the '70s." "What are we going to do about the existing housing stock that's been built in these places?" said Max Moritz, a wildfire specialist at UC Santa Barbara. "For the existing housing stock that's out there, that isn't built to these codes, we have a massive retrofitting issue on our hands. They have structure ignition vulnerabilities that are built into the situation, they're baked into the problem." "I knew we were in the middle of the forest," Oney Carrell said during a recent visit to Paradise. "Why wouldn't you do everything you could to make it last?" But even he's amazed that their home made it. Stepping over a blackened patio drain just a few feet from the back of the house, he wondered aloud: "I don't know why it stopped here." It's almost impossible to say for certain why some homes are still standing in Paradise, while others were ruined. Landscaping surely played a role; fire experts say homes buffered by so-called "defensible space" probably did better than those wrapped in shrubs. Luck was a big factor, too, as homes were no doubt spared by last-second shifts in the winds. Nevertheless, experts say, McClatchy's analysis reinforces their belief that California's fire-safe building code can make a difference in an era of increasing vulnerability. 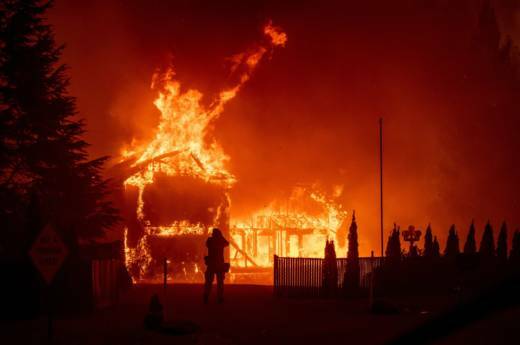 Daniel Gorham, a former firefighter and U.S. Forest Service researcher who works for the Insurance Institute for Business & Home Safety in South Carolina, said the California code is becoming a model for other fire-prone states. "California is leaps and bounds ahead of other parts of the country," Gorham said. "California is on the forefront." Advocates say fire-resistant building materials aren't particularly expensive. A study last fall by Headwater Economics, a consulting firm in Bozeman, Montana, found that "a new home built to wildfire-resistant codes can be constructed for roughly the same cost as a typical home." But getting Californians to retrofit homes built before 2008 is an enormous task. The state requires property owners in fire zones who replace at least half their roof to install "fire-retardant" materials on the entire roof. Other than that, however, there's nothing forcing Californians to safeguard their existing homes against fire hazards. A few California cities have taken matters into their own hands. In 2008, the City Council in Big Bear Lake, a community of 5,200 in San Bernardino County, passed an ordinance declaring wood shake shingle roofs "a severe fire hazard and danger" and ordered homeowners to replace them by 2012. Armed with state and federal grants, it offered cash incentives of up to $4,500 apiece for new roofs. Although the grant program has run out, "I can't think of the last time I saw a shake roof in Big Bear," said Patrick Johnston, the city's chief building official. A law signed last year by former Gov. Jerry Brown requires the state fire marshal to develop a suggested list of "low-cost retrofits" by January 2020. The state would then promote these retrofits in its education and outreach efforts. California also might start throwing cash at the problem. A new bill, AB 38, introduced earlier this year by Democratic Assemblyman Jim Wood of Santa Rosa, would create a $1 billion "fire hardened homes revolving loan fund" to help homeowners retrofit their properties. The issue is personal for Wood, a dentist who spent weeks helping identify victims from the Camp Fire and the wine country fires of October 2017. Although eligibility terms haven't been spelled out, the bill would offer low-interest and no-interest loans to help those who otherwise couldn't pay for new roofs or other safeguards. "A lot of these small towns are not as well off financially," he said. "We need to find a way to help them, especially if they're poorer." The fund might not be nearly enough to go around — not with hundreds of thousands of homes in need of retrofits, and a new roof alone costing $10,000 or more. "The $1 billion, indeed, that's not enough to rehab every home," said the Building Industry Association's Raymer. But he said it's "an absolutely excellent way to kick things off." Wood said state officials would have to figure out a plan for parceling out the money to where it's needed most — probably starting with lower-income areas near forests. "Obviously we want to affect the areas with the highest risk first," the assemblyman said. "A lot of these small towns are not as well off financially. We need to find a way to help them, especially if they're poorer." In response, the Legislature ordered the Department of Fire Protection and Forestry to start mapping major fire risks in California, in the hinterlands as well as urban areas. The result was a collection of maps of the state's "fire hazard severity zones," encompassing more than one-third of California's land mass. Based on factors such as terrain, vegetation and weather patterns, the zones represent Cal Fire's attempt to predict the probability of a fire starting and the likelihood that it could become significant, said Cal Fire's Sapsis. "A window breaks, a vent breaks, the fire gets into your home and you've got an interior structure fire," said Joe Poire, the city of Santa Barbara's fire marshal. Enforcement of the building code carries a few wrinkles. In the mainly rural areas where Cal Fire is in charge of fire protection, the Chapter 7A code is automatically enforced in any region that Cal Fire has designated as a "severity zone" — moderate, high or very high. In urban areas that have their own fire departments, the code is generally used only in spots where Cal Fire says the threat is very high. Local governments have the discretion of rejecting the Cal Fire designation, and Sapsis said some city councils have been squeamish about the state's maps because of fears that the Chapter 7A code will inflate construction costs, or for other reasons. Yet interviews with local officials throughout California by McClatchy indicate that the vast majority of cities and towns go along with Cal Fire's recommendations. Santa Barbara city officials extended the building code to coastal areas that had been overlooked by Cal Fire's mappers. The map omits small portions of Paradise, but the building code is enforced across the entire town, said Paradise public information officer Colette Curtis. Before Paradise exploded, Santa Rosa's Coffey Park was the poster child for recent California wildfire disasters: Five people died and 1,321 homes were destroyed by the Tubbs Fire in October 2017. Coffey Park wasn't subject to California's Chapter 7A building code. Unlike some areas of Santa Rosa, the neighborhood hasn't been designated a "very high fire hazard" zone by Cal Fire. City officials are OK with that. Although developers rebuilding Coffey Park are being urged to consider fire-resistant materials, city spokeswoman Adriane Mertens said the city doesn't see any reason to impose the 7A code in the neighborhood. "There were very, very high winds that night," Mertens said. "There were embers that were blown across the (Highway 101) freeway, across six lanes of freeway, into Coffey Park." Jack Cohen, a fire scientist in Montana who helped develop the 7A code, said he thinks Santa Rosa is committing "an error in judgment" by rebuilding without the safeguards. In any event, Cal Fire is updating its fire hazard maps over the next year or so, taking into account more sophisticated data on wind and other climate factors, and Sapsis said spots such as Coffey Park could wind up designated as high-risk areas. Once the maps are done, any region placed inside Cal Fire's "very high fire" zone will have no choice but to comply, under a bill signed into law by Brown last year. Look at Folsom, widely considered one of the most vulnerable places in greater Sacramento to fire. The county's hazard mitigation plan says 44,000 residents of Folsom are already at "moderate or higher wildfire risk." The development is on land that used to be subject to the strict state building code. Now it isn't. How did that happen? Years ago, the land was outside Folsom's city limits and Cal Fire was responsible for its safety. Cal Fire's maps put the land in the "moderate" risk zone — a threat level high enough that, under the state's regulations, the fire-safe building code took effect. As it happened, no construction took place during that time, city officials say. The situation changed when the city annexed the land to forge ahead with Folsom Ranch. Because the land has never been in the state's "very high" risk zone, the city feels comfortable letting Folsom Ranch develop without the Chapter 7A building code. Fire Chief Felipe Rodriguez said Folsom officials are still open to "the possibility of strengthening, hardening, our future homes." But for now, the city is only requiring homeowners' associations to implement a "vegetation management" plan and install fire-resistant fencing around properties that abut open space areas, Rodriguez said. Is Folsom courting danger? Rodriguez doesn't think so. The city will build two fire stations in the development and will "be able to suppress a fire during its early stages," he said. The hundreds of thousands of older homes in fire zones aren't just more vulnerable in their own right. "One little house built to a new standard, surrounded by a bunch of older stuff, is likely to get swamped," Sapsis said. Paradise provided a grim reminder of that problem. The Camp Fire destroyed more than 80 percent of the 4,100 mobile homes in its path, whether they were built to the new code or not, according to McClatchy's data analysis. That isn't surprising, Sapsis said, given that many of Paradise's mobile homes were jammed alongside one another in mobile home parks. "They're stacked so close together, they're like sticks in a fireplace," Sapsis said. Sapsis and others say the lesson is that strong building codes aren't enough. In particular, experts say communities must pay more attention to how they lay out their neighborhoods, allowing for firebreaks and enough space between houses. "In the name of affordable housing, we're moving housing closer and closer to one another," said Chris Dicus, a forestry and fire expert at Cal Poly, San Luis Obispo. "That serves to have house-to-house-to-house ignition." The problem isn't limited to densely-packed urban areas. "I live in a rural community, and I have got six feet basically separating me from my neighbor," said Dicus, who lives outside of Morro Bay. In addition, experts say California is struggling to enforce the state law regarding "defensible space" around properties. The law requires that property owners maintain as much as 100 feet of defensible space around homes and other buildings in and around "a mountainous area, forest-covered lands, brush-covered lands, grass-covered lands, or land that is covered with flammable material." That means keeping trees and shrubs pruned and spaced far apart. Within five feet of the building, property owners are supposed to remove anything that could catch fire: mulch, plants, woodpiles and so on. In practice, however, enforcement of the defensible space law has been spotty at best. Raymer, of the California Building Industry Association, said most property owners don't understand how to maintain their yards. The state doesn't impose penalties for non-compliance, and only a few local governments have chosen to do so, Raymer said. Legislation could change that. SB 190, by Sen. Bill Dodd, D-Napa, would require the state fire marshal to develop a "model defensible space program," including penalties, that local governments could adopt. The problem extends beyond homeowners' property lines. Gov. Gavin Newsom, finding some rare common ground with the Trump administration, is advocating for more aggressive management of forested lands. All that work "did exactly what we hoped it would do," said Calli-Jane DeAnda, executive director of the council, which secured $1 million in grants to remove fuels from forested areas. "This investment of public money is so worth the effort." "That is an absolute lab experiment for us," Sapsis said. On the streets of Paradise, though, community leaders are taking a more measured view. Zuccolillo, the town councilman, said asphalt roofs and stucco siding might "give us more of a chance" but he doubts they will guarantee Paradise's safety. "I saw metal buildings, metal and stucco buildings, burn to the ground," he said. Still, there's plenty of evidence, all over Paradise, that the state's building code can protect property. Like the flag, the house is still standing. The Herrs' home, built in 2010, suffered a bit of scorching and some interior smoke damage — the smoke is bad enough that they're still temporarily living in Chico and aren't certain they'll move back. "Our yard and the construction of the house saved it for sure," Dawn Herr said, gesturing to a small scorch mark by the side of the house. "You can see it tried to catch on fire."